After being paired up on a class project with the new girl at school, Abigail, Timothy finds himself caught up in events that start to blur the line between reality and nightmares. The two must work together to see if they can solve a mystery that spans decades, and save themselves in the process. 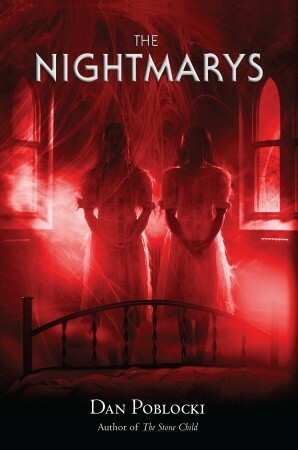 Although The Nightmarys does occasionally fall into the trap of oversimplifying elements of its plot to the point of distraction, I actually found it quite an enjoyable read. My favourite aspect of this young adult novel was the concept that the characters were having their fears used against them. While not exactly the most original concept, it allowed for some variety in the way that danger was manifested for the affected characters, rather than having them just face off against one foe throughout the novel. I also liked Abigail’s kick arse grandmother, who may have occasionally struggled with stairs, but was at least willing and able to throw herself into the fray when possible. It was kind of refreshing to have an adult in a young adult novel not be clueless, or straight-out useless, for once. There are times when the plot seems to get a bit unwieldy, with its blend of horror and mystery/crime elements; and this means that plot points have a habit of being picked up and then dropped without any fanfare, as the story progresses. And, as much as I enjoyed the core concept, I think it was applied in a rather inconsistent manner, depending on what needed to happen in order to make the story follow the path of least resistance. This might make for a linear read, but it’s not always the most interesting choice. Still, like I said, overall I found The Nightmarys to be an enjoyable read. As long as I accepted it for what it was – some light summer reading – I was happy.